Born at Goulbourn, Ontario on 6 October 1850, son of Francis and Margaret (Huson) Buchanan, he attended grammar school at Richmond and, after a period spent teaching, attended the Collegiate Institute at Cobourg, matriculating into Victoria University in 1879. 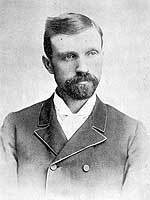 He entered the Montreal Conference of the Methodist Church in 1881, subsequently working at Mallorytown and Cataraqui. In 1884, he moved to Spirit Lake, Iowa where he was ordained a deacon. The next year, he was stationed at Rossburn, Manitoba for a three-year period, was ordained at Winnipeg in 1886, then was posted at Birtle for three years, Crystal City for three years, then to Carberry in 1892. He married Julia Ann Judd of Mallorytown, Ontario, with whom he had four sons. He died on 3 December 1925.